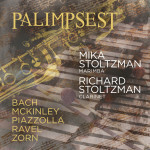 Mika Stoltzman has been described by The Los Angeles Times as a “high-wire marimbist … an amazing, energetic performer ready for major exposure.” She has toured to 19 countries and 65 cities and has performed at major venues and festivals including Carnegie Hall, PASIC, New York’s The Blue Note, the Tokyo and Cairo Jazz Festivals and the Rockport Jazz Festival. Her albums include Mitsue (1998); Marimba Phase (2003); Marimba Madness and Mikarimba (2010); If You Believe with Steve Gadd (2013); and Duo Cantando (2017) with her husband, the clarinetist Richard Stoltzman, plus special guest Chick Corea and the Boston Modern Orchestra Project. Mika Stoltzman’s arrangement and performance of Tokyo/Vermont Counterpoint is featured on Steve Reich’s Triple Quartet (Nonesuch). She appears on Richard Stoltzman’s Goldberg Variations (BMG Japan) and Jo Hisaishi’s Asian X.T.C. (Universal Japan). Mika and Richard Stoltzman perform around the world as a duo, appearing at major venues in locales including New York, Boston, Austin, Buenos Aires, Mexico, Hong Kong, Japan and Germany.